Another month, and yet another great selection of kits from Studio Calico. I was at first worried about the plethora of pinks in the Camelot scrapbook kit, but ended up making a couple layouts just from those that I really love. I was eager to use the Mister Huey's Ink Dauber, and decided polka dots would be perfect to add to the middle of this layout. The funny thing is that the photos we took right after this included 2 more girls. And then this is another one using only the Camelot scrapbook kit. The map paper is seriously one of my favorites ever and also comes in the patterned paper add-on. Using the add-on's, I made a couple more layouts. Noticing that Jack is making a debut on most of my projects these days. He's taken up just about all my space on my phone, so it only seems fitting that I would print those photos and use them all over the place. With the intention of logging all the places he's been via airplane, I ended up listing road trip destinations on the shipping tag with my typewriter. Because I forgot Tampa, it was easiest to just write it in pen at the bottom. The wood tape and alphas in the Merlin add-on are awesome. Using the Project Life main kit only I created a full spread on an eventful day, March 1st. There was a lot of hand stitching involved, as you can see. Instead of rubbing off to reveal the word "happy" from the YOU MAKE ME ____ WHEN SKIES ARE GRAY card, I wanted to keep as much of the gold as possible. And though the shiny pink accents look like they are very dimensional, I like the fact that they are fairly flat. The tiny white alpha rub ons work like butter. You can shop for all the Camelot kits here and see all my Camelot projects here. 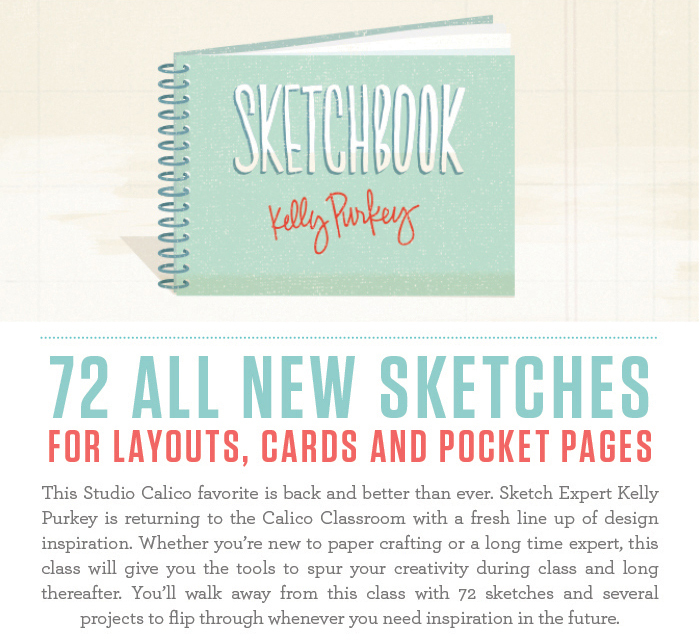 And last but not least, I am a contributor for the latest installment of Kelly Purkey's Sketchbook class. Here's a sneak peek at a layout I made using the exclusive stamp set, which I believe is still available and ships free upon purchase. Sketchbook is enrolling now through April 30th at 11:59pm EST, and the first class lesson will be posted on May 5th at 8am EST. Excited to see you all in the classroom!